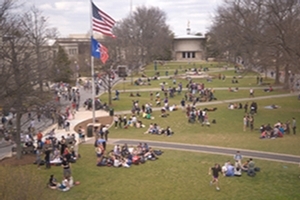 Students enjoying a late Autumn day on the quad. Go to office hours and talk, even when you don’t have a specific question. These relationships will help you grow—and help when you need a recommendation. Not a morning person? Don’t register for early morning classes. Can’t stop yawning after 7 pm? Then steer clear of evening classes. Either type or hand-write your class notes over again after class. Information retention is higher when the information is reviewed within 24 hours. The Academic Support and Access Center offers free tutoring for some classes. The Writing Center will help you shape your papers. And the Math/Stats Lab will help you hone your math skills. 5. Get Involved and Explore. Being active on campus will help your academic performance and expand your social circle. Be open to exploring different classes and majors. Bonus Tip: Visit your Academic Counselor. Not only do they know a lot of stuff about AU, but they are awesome people and want to get to know you!